The public needs a free press to show how this accounting fraud works. Their signature cover is to divide and destroy the family they victimize. The only protection famlies have against these accounting fraudsters is for every member to recognize the patterns before it's too late. In 25 years, not one authority has tried to stop the accounting fraudsters from using our innocent sister as an unwitting agent. Not one. The fraudsters signature pattern is to divide and conquer your family. They weaponize your trust. The public automaticially trusts them because the Commonwsealth of Virginia holds them out to the public to be automatically trusted. They are ruthless. They are above the law. Believe it or not, this accounting fraud is protected. The public is not. The only protection the public has is to recognize the patterns before it's too late. The fraudsters signature cover is to use a trusting family member to unwitting tear apart the family they victimize. Going right for the jugular under the guise of a fiduciary relationship appears to be the perfect cover. They take control of a family's assets by attacking the family fiduciaries and supplanting them. There is nothing you can do to stop it if one member of your family trusts them. Divide and conquer; A family, a state, a country, a world; the patterns are basically the same. Plant conflict, lies, secrecy, fear, and hate. Watch it grow. Pretend there's no connection to what was planted. They are ruthless. They are above the law. They make a mockery of a fiduciary relationship and the rule of law. Intentionally breaking up a family is a human rights violation for God's sake. The only protection families have is for every member to recognize the patterns before it's too late. The public needs a free press to show the public how the fraudsters work. Why haven't they? I believe they are afraid; and for good reason. There is no known limit to the reach and power of these fraudsters and their collaborators. The biggest obstacle to recognizing the patterns is the Oh-no-they-wouldn't-do-that-much-less-get-away-with-it mindset. To dismiss it out of hand. They will do that and they will get away with it. Secrecy is essential to the fraudsters and fatal to the family. If the whole family rejects secrecy, the fraudsters will go away. Why does Virginia, having both Senators former Governors of Virginia, Havard Law, and humanitarians, protect this accounting fraud instead of the people? If Senator Mark Warner thinks it's a good idea to regulate Facebook, Twitter, and Google, why not regulate this obviousd accounting fraud? I have been character assassinated and setup since 1985 for trying to stop the fraudsters. Not one leader has confronted them. Not one leader has made any attempt to expose their accounting. Not one leader has made any attempt to stop them from using our innocent sister. Not one. This takes an extremely high degree of silent cooperation. I pray Justice will find who decided this. 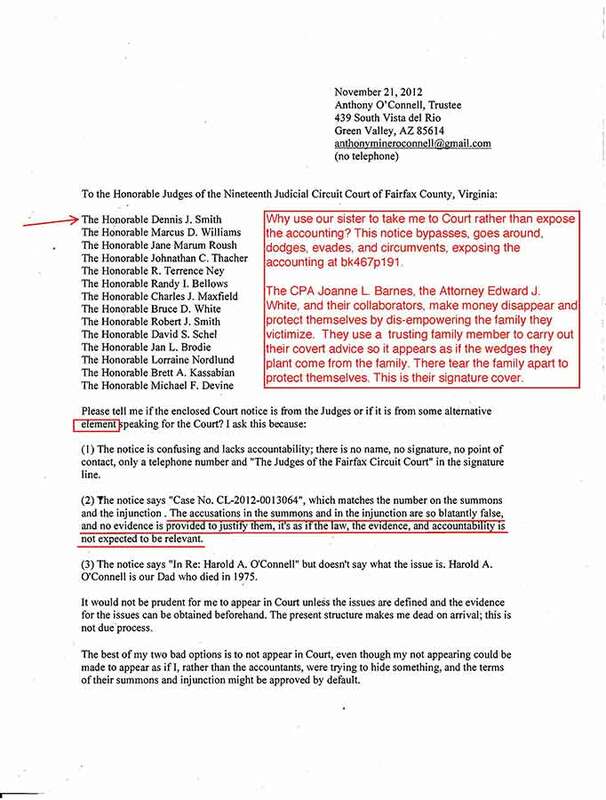 Is there not one leader in Virginia who would recognize that the accounting fraudsters signature cover is to use a trusting family member as an unwitting agent? Is there not one leader in Virginia who would do whatever it takes to stop our innocent sister from being used (Last known address: Jean Mary O'Connell Nader, 444 Summit Street, New Kensington, PA 15068 Tel 724 337-7537)? Those who don't want the accounting exposed want Jean Nader in because they can use her to unwittingly carry out their agenda and she will not try to expose their accounting. They want me out because I have experience in accounting and try to expose the fraudsters accounting. 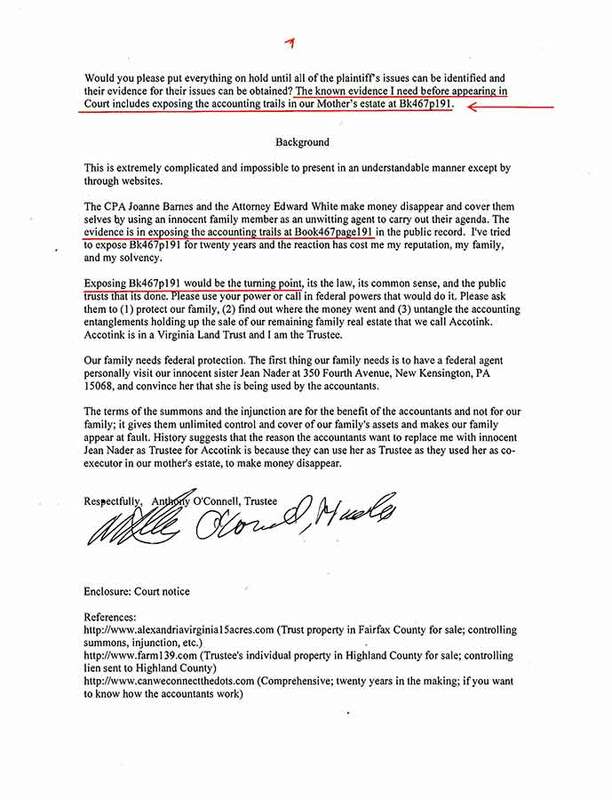 Is there not one leader in Virginia who would recognize that ignoring this Deed blocked me from selling the Trust property and forced me to pay the real estate taxes until I ran out of money? That my Trusteeship was sabotaged from day one? Is there not one leader in Virginia who would recognize that my 1994 and 2000 Exceptions to the Commissioner's Report disappeared after being received by the Court? See links 8 and 9 below. 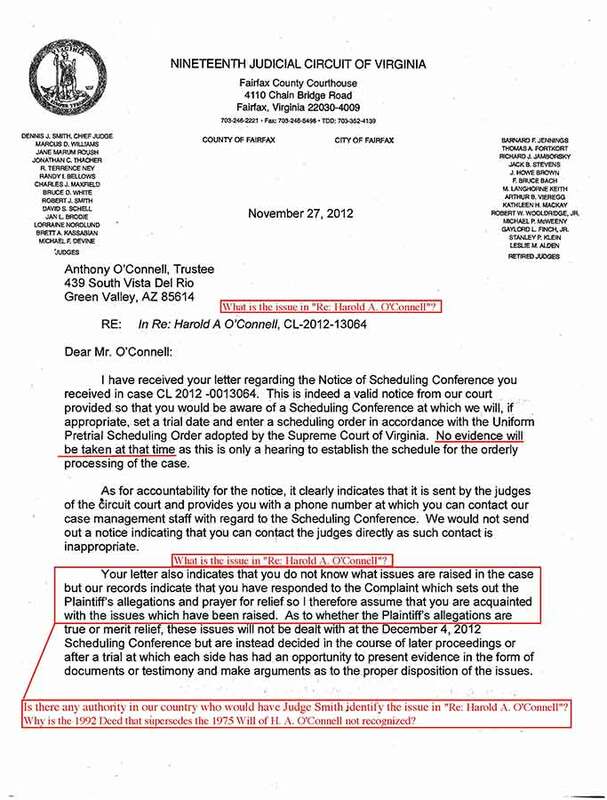 Is there not one leader in Virginia who would recognize that seventeen (17) of my eighteen (18) responses to the Complaint against me disappeared after being received by the Court? I believe the notice below is in response to my trying to expose this accounting fraud. There is no legitimate reason for the notice below. 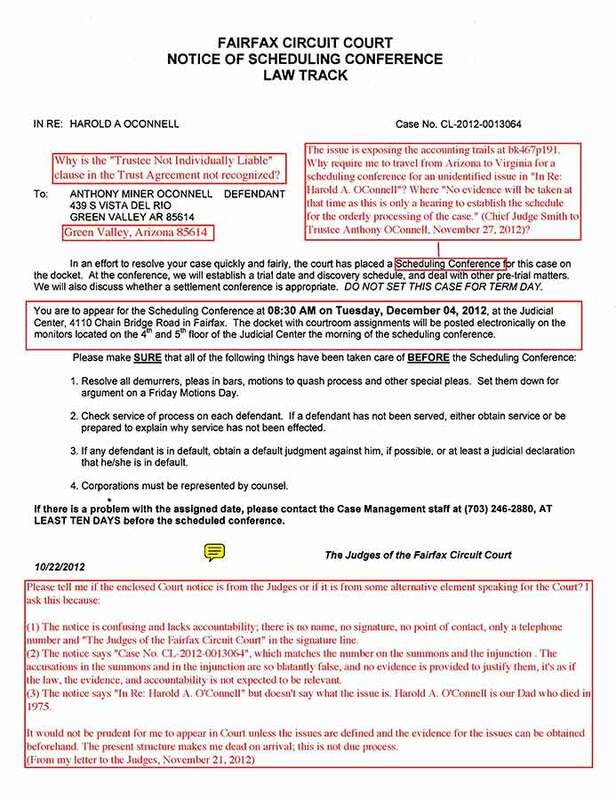 Out of State people can be ordered to appear in Court for something like " No evidence will be taken at that time as this in only a hearing to establish a schedule for the orderly processing of the case." If they don't appear it is justification to enter any Order against them. I am ordered to travel from Arizona to Virginia for this while the accounting, which is the issue, remains concealed and ignored. My not appearing is justification for entering an Order against me. To expose accounting fraud, expose the accounting. To keep it concealed, don't. 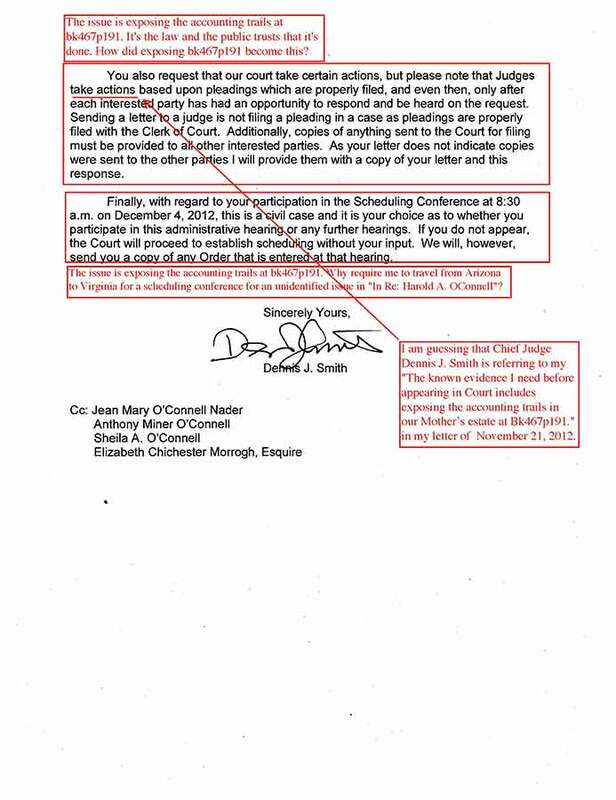 Please look at my seventeen responses that disappeared after being received by the Court on 9/25/2012 at 10:44 am. How obvious does it have to be before the rule of law is applied? I've had 33 years of character assassinations and setups with no end in sight, for trying to stop accounting fraudsters from preying on our family. I am not aware of any leader attempting to expose their accounting or confronting them. If some power doesn't apply the rule of law it will kill me.